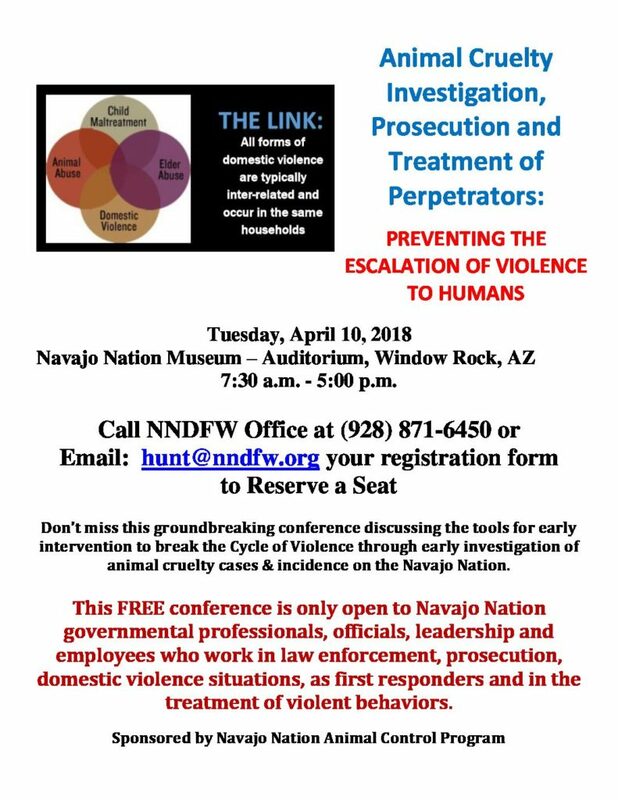 The Navajo Nation Animal Control Program has scheduled an Animal Cruelty Investigation, Prosecution and Treatment of Perpetrators: Preventing the Escalation of Violence to Humans conference Tuesday at the Navajo Nation Museum in Window Rock. Glenda Davis, animal control program manager, said the all-day conference, which is free, is to increase awareness of how the investigation, prosecution and treatment of animal cruelty can provide early intervention into domestic violence situations. Davis noted, “This conference is only open to government professionals, officials, leadership and employees who work in law enforcement, prosecution, domestic violence situations, as first responders, and in the treatment of violent behaviors. She added that data shows that people who abuse animals are five time more likely to commit violent crimes against people, a history of pet abuse is one of the four most significant risk factors for becoming a batterer, 83 percent of homes with abused and neglected pets also had abused and neglected children, and 71 percent of battered women report their abusers hurt, killed or threatened their pets to control them and their children. This entry was posted in News Articles, Professional Journal and tagged animal cruelty, domestic violence, Navajo by Marley Shebala. Bookmark the permalink.